No matter how much you take care of your dog, they often develop those very distracting, messy, reddish-brown tear stains drizzling down from their eyes. And just as quickly as you wipe them off, they return! Tear stains can be due to several reasons, such as certain health problems, the shape of the eyes, ingrown eyelashes, blocked tear ducts, puppy teething, an ear infection, or allergies related to food or something in their environment. Dogs with light-colored fur are more prone to tear staining and, of course, the dark streaks are more noticeable on them. It is important to deal with tear stains, beyond just cosmetic reasons. When tears cause the hair on the dog’s face to remain wet, your pet may develop an yeast infection, making the staining even worse. While the stains are unsightly, they are not dangerous to your dog’s health. Tear stains are usually easily removed with a few simple treatments. They can also be easily prevented, once they have been removed. 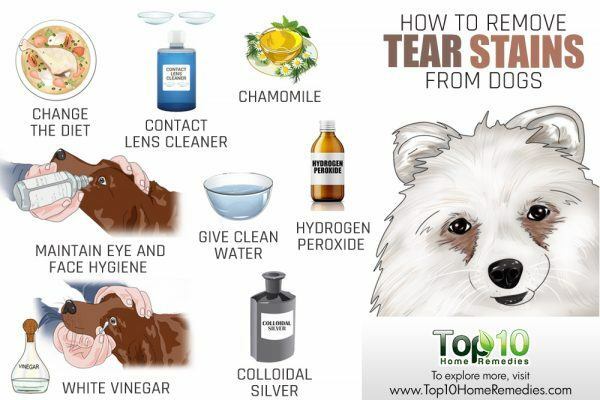 Here are the top 10 ways to remove your dog’s tear stains. Many times, a poor diet can result in tear stains. So, take a look at what’s in your dog’s food and consider changing it to see if it makes a difference. 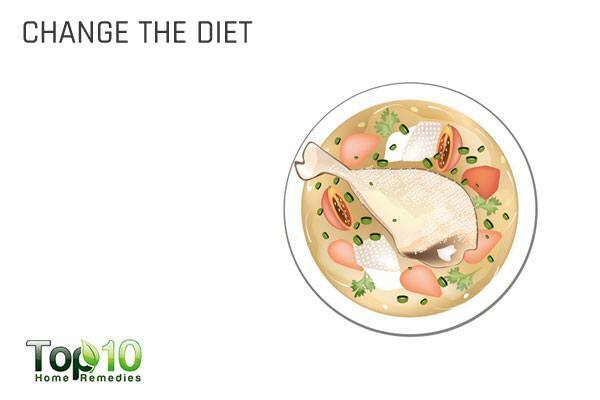 Opt for a high-quality, grain-free diet. A grain-based diet does not provide long-term health benefits to your dog. 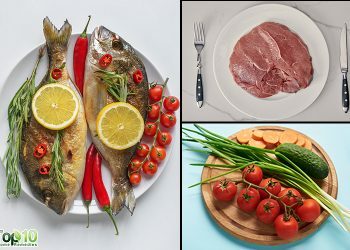 Also, such a diet can cause allergic reactions, resulting in excess tearing and other problems. Feed your pet quality dog food and treats as well as probiotics for canines. You must also pay attention to the water your pet drinks. Dogs should be given purified, distilled water to drink. Avoid tap water, which often contains harmful bacteria, parasites and minerals like chlorine and fluoride that can be toxic to pets. Make sure they do not drink stagnant water found in gardens or parks. 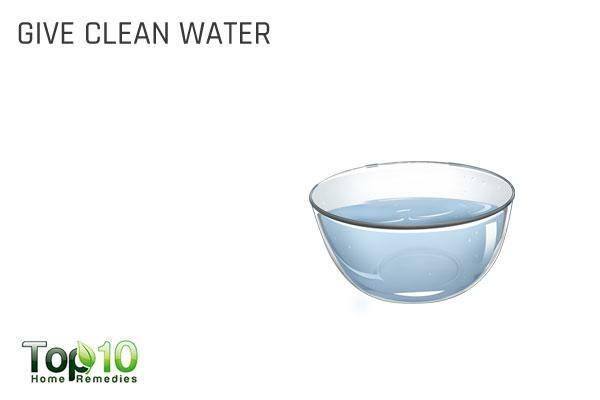 Such water may result in more staining in response to excess minerals in the water. Also, keep in mind not serve your dog’s food and water in plastic and ceramic dishes as they tends to become unsanitary after repeated use. Always use stainless steel or glass bowls for your pets and make sure to wash them with soap and water from time to time. To prevent ugly tear stains from developing, it is important for owners to maintain proper eye and face hygiene of their pets. This will go a long way in keeping those stains at bay. 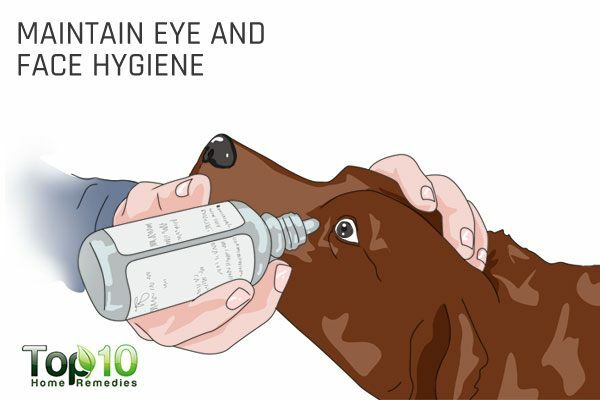 Regularly flush the eyes with an appropriate canine eyewash, recommended by your vet. Moisten a cotton ball with canine eyewash and gently rub it underneath and around the eye area. Wash the muzzle hair with dry shampoo and a wet washcloth. Comb and blow-dry it afterwards. When bathing your pet, avoid getting water in your dog’s eyes to prevent irritation. The hair around your dog’s eyes can cause eye irritation, leading to more tears and subsequent staining. 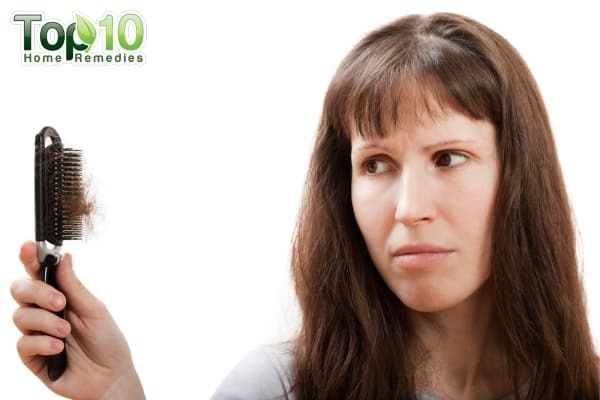 Keep the hair around the eyes trimmed to prevent irritation. Be sure to use a pair of blunt-nose scissors and work carefully to avoid accidentally injuring an eye. 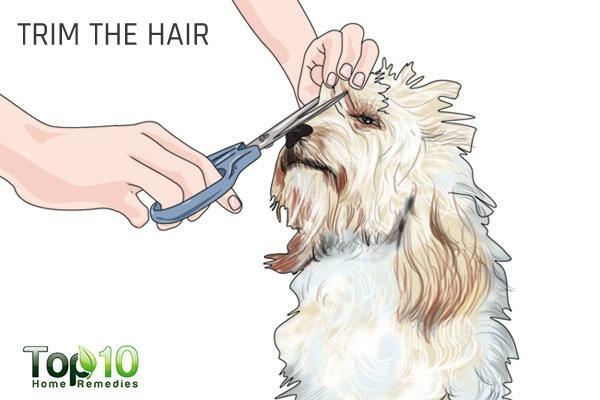 If your dog is prone to excessive crusting in the corners of the eyes, ask your groomer to shave the hair off so you can effectively clean the skin under the eyes. 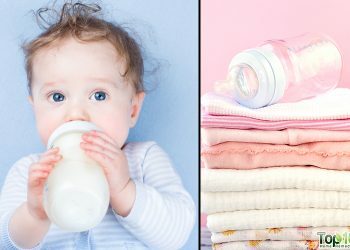 Cornstarch can help absorb the excess tears and effectively get rid of tear stains. 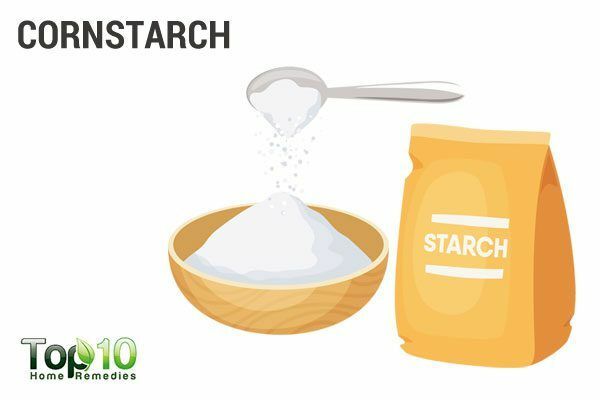 Mix 2 teaspoons of cornstarch with a little hot water and 1 drop of bleach. Allow the mixture to cool to room temperature. Apply it directly on the tear stains and allow it to dry for at least 1 hour. Finally, wipe it away with a damp cloth. Repeat the treatment every other day for 2 weeks. Cornstarch can also be dusted underneath the eye, around the muzzle and between the toes. 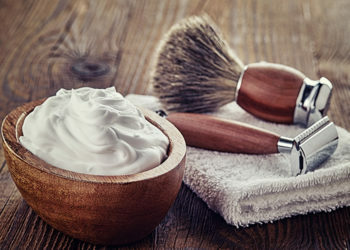 Alternatively, you can prepare a paste of equal parts corn starch, 3 percent hydrogen peroxide and milk of magnesia. Apply this creamy paste on your dog’s tear stains, leave it on for an hour, then rinse it off. Note: Be sure to avoid getting any of the solution in your dog’s eyes, as it could cause irritation. White vinegar is another very effective remedy for tear stains. Its acidic nature will prevent bacteria or yeast from taking hold in your dog’s system, which can cause eye infection and excess tearing. It may also help prevent future stains. Dip a cotton ball in white vinegar and use it to clean the stained area around your dog’s eyes. Do not allow the vinegar to enter the eyes. 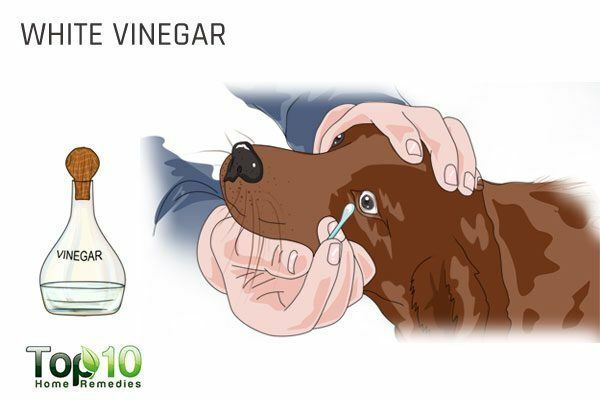 Also, add 1 teaspoon of white vinegar or apple cider vinegar to your dog’s drinking water to combat the growth of micro-organisms in the body and make it more alkaline. To remove the tear stains from your dog’s face, you can also use hydrogen peroxide. 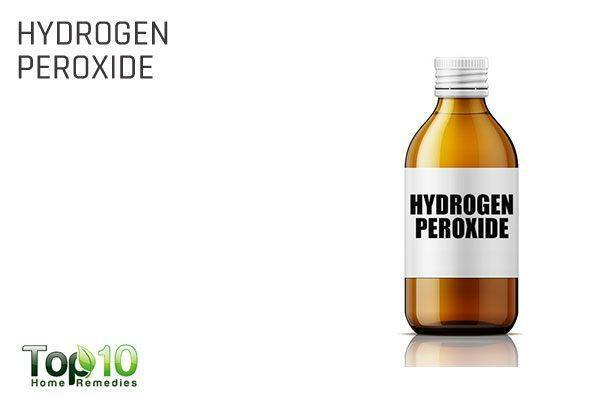 Prepare a solution of 3% hydrogen peroxide and an equal amount of water. Gently apply the solution over the tear stains using a cotton ball. Wait 5 minutes, then rinse the fur with clean water to get rid of any residue. Note: Peroxide can be irritating, so avoid getting the product in your pet’s eyes. 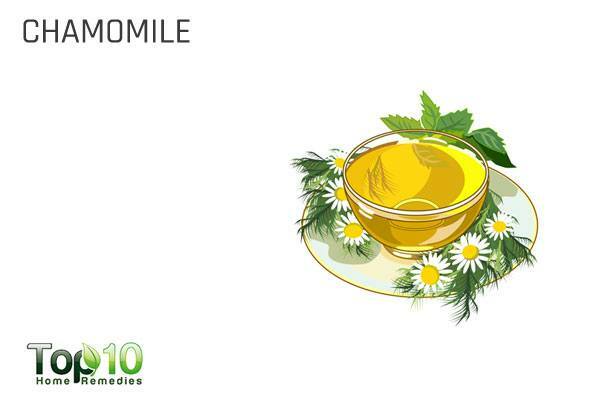 If you are looking for a natural home remedy to get rid of the tear stains, chamomile is very effective. Chamomile has anti-inflammatory properties and can help combat the bacteria and fungi that may grow in the tear stains. Prepare a weak cup of chamomile tea. Allow it to cool down completely. Use the solution to clean the tear stains from your pet’s face. Finally, rinse the fur with clean water. Colloidal silver has antimicrobial properties that help fight yeast infections and moist dermatitis that can occur in the corners of your pet’s eyes. 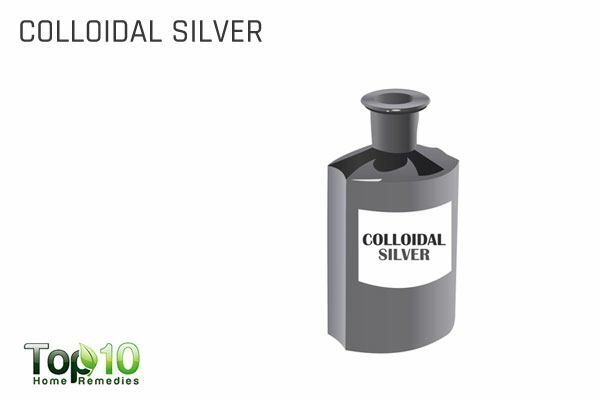 Also, colloidal silver is completely safe to use around the eyes. You can get it from any health food store. Put a little of the colloidal silver on a cotton ball. Use it to wipe your pet’s face once or twice a day. 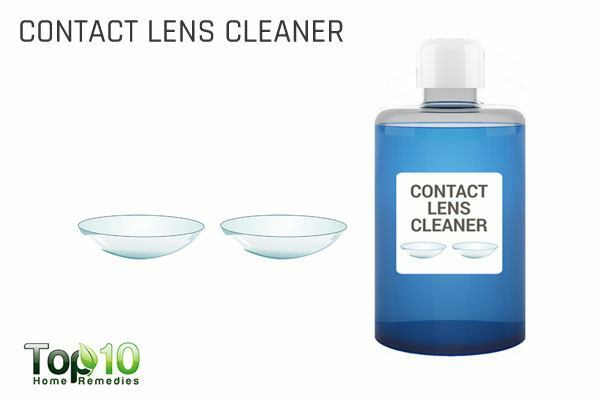 Contact lens cleaners that contain mild boric acid can also be used to deal with tear stains. Boric acid presumably oxidizes the iron compounds and lightens them. Put the solution on a cotton ball. Use it to wipe your dog’s face and tear stains. Do it once or twice daily to lighten tear stains that have already formed. 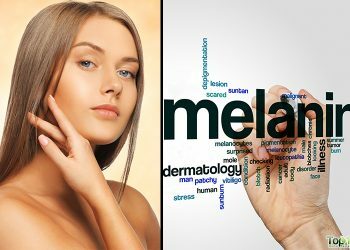 Keep the moist areas around the eyes as dry as possible. Use paper towels to absorb the excess water around your dog’s mouth after drinking water. Mild antibiotics can also be used, after consulting your vet. Dab a little coconut oil on the moist skin where tear stains accumulate to prevent the skin from becoming irritated and inflamed. Thanks, grateful for your home remedy materials which are of the essence. I have never noticed this trick listed. When I am about to bathe my Maltese, I rub Vaseline into any stained areas (and the “eye boogers”) about an hour before. It softens them so that it’s not so hard to grasp or comb them out, making it less painful/stressful for the animal. This also works well (she does play outside) when anything like a burr or other foreign thing gets caught in her fur (she gets them in the corners of her mouth) to remove them painlessly. Thanks for all the good suggestions!! Equal parts = volume. Teaspoon for teaspoon.